Sorry, no matches on eBay for "Songs From A Solitary Home Major Parkinson". Songs From A Solitary Home is ranked 2nd best out of 3 albums by Major Parkinson on BestEverAlbums.com. 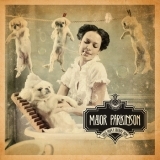 The best album by Major Parkinson is Twilight Cinema which is ranked number 68852 in the list of all-time albums with a total rank score of 3. Related links: top tracks by Major Parkinsontop tracks of the 2010s, top tracks of 2010.